It's been just over 1 ½ years since Tranzmile took on the Australian and PNG distribution of Q8 Oils and they are starting to make some big inroads into the highly competitive oil market. 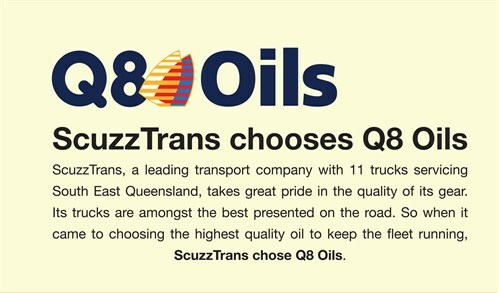 Just one of the fleets that has recently changed to Q8 Oils has been ScuzzTrans, a south east Queensland based company that specialises in the transportation of shipping containers. ScuzzTrans service the Port of Brisbane 24 hours a day seven days a week with our fleet of eleven trucks, as well as covering northern New South Wales, and operate some of the best know trucks in the industry, including NED, probably Australia’s most famous Western Star, which features an impressive Ned Kelly themed custom paint job, and a unique interior featuring various calibre brass casings for switches. 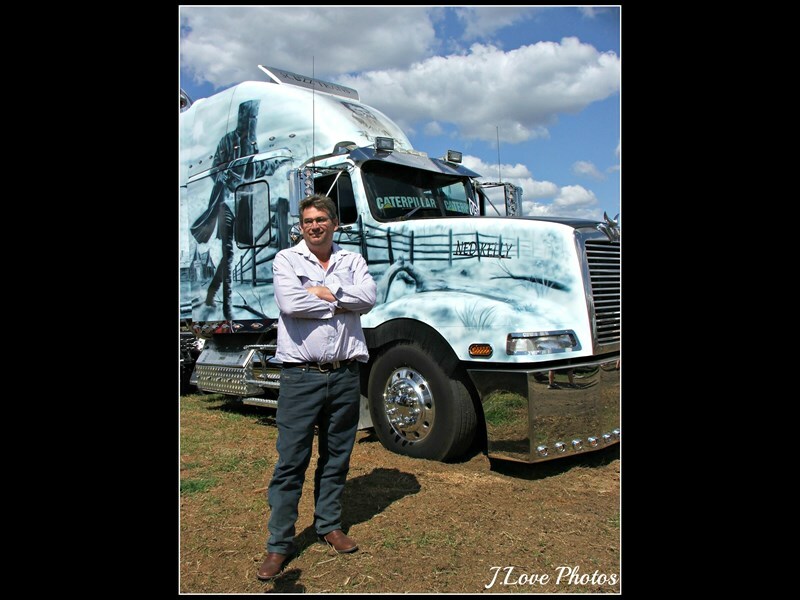 Owner Andrew McSweeney says that ScuzzTrans takes great pride in the presentation of the ScuzzTrans fleet, being amongst the best presented on the road. So when it came to choosing the highest quality oil to keep the fleet running, ScuzzTrans chose Q8 Oils. Managing Director of Tranzmile, Cameron Black, said that the feedback they had received since taking on Q8 Oils had been overwhelmingly positive. "We have a large number of fleets and workshops as customers of Q8 Oils now which is really great, but a not so well known fact that many people may not realize is that we also use Q8 Oils exclusively in all of our own company owned workshops. Tranzmile’s sister company Black Truck Sales operates full service Iveco, Western Star and Isuzu Truck dealerships in Toowoomba, Dalby, Roma, Goondiwindi and Moree, and we have been really impressed with the quality of Q8 Oils. Q8 Oils claim that it is the highest quality mineral oil available, and I have to say based on its performance with us I would have to agree with that." "This consistently high performance it is delivering for us and for our customers has really contributed to the rapid uptake of the product, which is really pleasing." If you are interested in trialing Q8 Oils, or perhaps in becoming a distributor, you can contact Tranzmile Managing Director Cameron Black on 1300 442 142.